A simple way to improve safety, ventilation and the appearance of your basement. Create a means of exiting your basement in case of an emergency. Comply with building codes. Purchasing is easy with the all-inclusive Egress Window Kits. Everything you will need to become code compliant is available with one click. With a narrower casement style window, creating a legal basement egress has never been easier. With the widest variety of styles and options found anywhere, you’re sure to find one that fits your taste. Meet fire safety codes. With the biggest selection to choose from, you can have the look and functionality you want. Add safety while keeping leaves, dirt, and debris from getting into your egress well. All of these items are in stock and ship out the next business day. On select Wellcraft Complete Egress Window Well Kits. Big savings on the exceptional line of Wellcraft Kits including the 2060, 2062, 6700, and the 5 section 5600. Welcome to Shop Egress Windows! Welcome to your one-stop location for the widest selection of egress windows for finished basements. These special basement windows meet the current IRC code for building a finished basement so you have peace of mind in the event of a fire or accident. What’s an “egress window”? An easy-to-open window that serves as an emergency exit for below-ground living space of any kind. Let’s be honest – during a fire, stairs could be blocked or damaged. 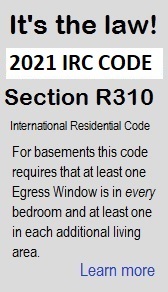 To avoid such dangerous situations, the International Residential Code requires a safe means of egress in all basements used partially or entirely as a living space. Just as important, these windows totally eliminate the "dungeon feeling" that many, if not most, basements have. Even finished basements can have stale air and primarily artificial lighting. With egress windows, you can have fresh air in your basement to improve your home’s overall ventilation, as well as increased natural light to brighten the space and make it much more pleasant. On this site you’ll find all the information you’ll need to create a finished basement - from product reviews to information on where to start. Are you a self-sufficient do-it-yourselfer? Our step-by-step installation guides and videos will practically hold your hand through the process. Not the DIY type? You can find an Installer who can do it for you. Regardless, you’ll find the perfect product for your situation. Learn whether your basement remodeling project requires a safe exit – it probably does – by looking over the IRC Code information. There you’ll find details on building code requirements for basement windows for egress, ventilation and natural daylight. Regardless of the basement use or project, a ready to install egress system is the key to bringing light, air, freedom and safety for you and your loved ones.